Wow! Eve & Adam was definitely not what I expected. This is a book that was so easy to read and get lost into it. It starts off immediately with Eve getting hurt and her mom fighting to bring her back to her medical facility. There's where she was given the best project of all. Create boy. Adam. Now that's a project that I would love to do. I would love to create my own boy/guy if given a chance. He'd have green eyes, perfect white straight teeth and a killer smile. LOL. 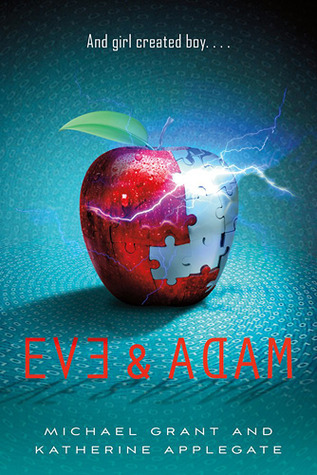 In Eve & Adam you get a few characters that bring so much to this story. You have a best friend in this story who has to be the most reckless person I've encountered in a book. Next you have Solo, he's smart and witty. He's up to something but you have to read to figure it out. And last but definitely not least, Eve. She's a smart girl who is bored out of her mind and wants nothing more than to have her best friend by her side. Together all three go through a journey where you should expect the unexpected. As revelations come into play, you'll see the reasons behind certain people's actions. It's bizarre. Ms. Applegate and her husband Michael Grant delivers a book that will draw you in from page one. You have a bit of mystery and some romance. I definitely enjoyed this book and can't wait for book two is will be called "Adam & Eve". I give this book a 4 stars and a definite Good Choice for Reading. This was definitely a very fast read-I wanted a bit more character development and exploration of genetics and the scientific themes but it was a fun read. Great review! I wanted more relationship development between Eve and Solo. But there's always next book. I really enjoyed this book! Solo was one of my favorite characters I loved him =D Great review! I'm glad you ended up enjoying this in the end. I've been looking forward to it for months. I'm addicted to the Gone series. Can't wait to read this one.